We just released Banshee 1.0 Beta 2, with a ton of bug fixes and some sweet new features! This is hot on the heels of Beta 1, released just over two weeks ago, and is the fifth release in the series leading up to 1.0. You can now use Banshee to subscribe to, browse, and search your favorite audio and video podcasts. Banshee displaying, streaming, and downloading podcasts You don't even have to wait for episodes to download to enjoy them; Banshee will happily stream the audio or video. And of course, your podcasts and subscriptions from Banshee 0.13.2 and before are migrated for you, and any podcast files in your Music Library moved into the Podcast source. Also new in this release is Auto Rip. After enabling it in Preferences, CDs will be automatically imported as soon as metadata is loaded for them and it's confirmed they're not already in your Library. The last big feature is we have integrated with Brasero, the powerful disc burning application, for audio CD burning. Check out the release notes for download info, more screenshots, updated dependency list, and the list of contributors. As always, you can chat with us in #banshee, e-mail us at banshee-list, and learn more about Banshee on our wiki. Digg It! Cool stuff :) When I tried the last 1.0 beta, full-screen mode would always full-screen to the primary screen, instead of whatever screen banshee was on. Is there a bugzilla where I can report this, or is this already fixed? I tried out Beta 1 two weeks ago and have to say that it is beautiful. I want to use it to replace Rhythmbox, Totem, and Miro, but I need one feature before I can do that. Banshee needs to be able to watch directories for new files. My videos and music will import fine (they're alread in ~/Music and ~/Videos), but updates aren't recognized automatically. Anyway, this is a beautiful piece of software. Keep up the good work. Mono is producing great apps. @chris: bugzilla.gnome.org, pick Banshee as the product. Congrats guys on another great release! Hi, do you know when is going to be available a DEB package for Ubuntu users of Banshee 1.0 Beta 2? @Guillermo: Check out the PPA link near the top of the post. I suspect that this came from using the Beta 1 packages from the Ubuntu PPA, which accidentally had podcasting enabled before it was ready. But I could be wrong. in itunes i could sort the album tag after album artist, really miss this! can i make a feature suggestion about this somewhere? What about daap support, is it possible to enable that somehow? @herman: I don't know about that tag, but you can definitely sort album after artist. @Sandy: I don't know about that tag, but you can definitely sort album after artist. i have installed beta 2 now and if i import one of my soundtracks, one entry shows up in “All Albums” for every artist on the album, like: Casino Soundtrack / B.B. King, Casino Soundtrack / Brenda Lee etc... If “All Albums” sorted after the “Album Artist” tag it would be just one entry, Casino Soundtrack / Various Artists (because that is what I have in my Album Artist tag...), but I could still use different artists in my “Artist” tag. one more! it seams to be something apple made up them selves, however my tags shows up in other players, like wmp - but nothing i try on linux! will stop spamming you now! Any plans for syncing the entire library to an iPod? This was in the original banshee and was a lot easier than the new method of syncing tracks individually. Sandy, I enabled daap using --enable-daap, but I still cannot figure out how to share or view shared libraries. There is a tab on the preferences window for managing extensions, and it shows DAAP being enabled, but there is not an option for turning sharing on. I have mt-daapd server running at home, and I would like to be able to pick up the music from that library. Any ideas? 3. Connect to your server's DAAP share. @Tim: Keep in mind the DAAP support in trunk / the 1.0 series is marked unstable for a reason - it's really not ready for end-user testing yet. @Tim: OK, apparently the (unstable) label was a bad choice and should have been (COMPLETELY BROKEN) so you'd get the point. I'm with Daengbo. Any plans to include a "watch folders" feature (for new, deleted, moved, renamed, etc. files)? I find this a pretty basic feature request. @herman: yes, a big sync-all button is planned to make a return..
@daengbo, sicofante: Watched folders and multi-artist album support are our two biggest, most imporant-to-fix bugs atm. They might not make 1.0, but they won't last long after it..
Conulations on the beta release. I have another tag question: does this release support the 'comments' tag? This is absent from practically every Linux-based music player with the exception of Amarok. I have an enormous collection that has 'mood' keywords in the comments fields, and I use these in smart playlists. Currently Amarok is the ONLY choice I have if I want to make use of these. Please add support for OPML. 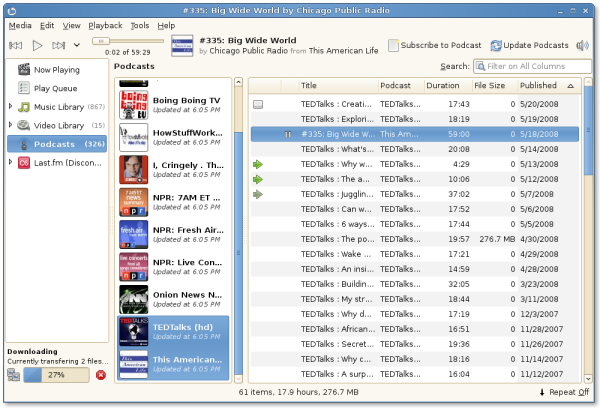 Podcast subscriptions can be huge, you don't want to re-add them feed by feed. I was wondering about the banshee for Windows. What is your policy on banshee on Windows? Is version 1.0 going to support windows as well? I heard a basic implementation for Windows is done a long time ago. As far as I know, the tag Apple made up is the "compilation" tag, this one does not belong to any standard but the "album artist" tag is a standard mp3 tag which lets you sort your compilations together.